A tooth extraction is the procedure to remove a tooth. Ideally, a tooth is only removed if there are no other options to prolong the usefulness of the tooth. A tooth extraction may be necessary if a tooth becomes severely damaged from decay, periodontal disease, or trauma. There are a number of other reasons why a tooth may need an extraction—lack of room for all of the teeth in the mouth in preparation for orthodontic treatment (braces), fractured teeth that cannot be saved with a dental crown, or even extra teeth or malformed teeth that are not functional. Usually, a tooth extraction is relatively straightforward and does not require much time. Using local anesthetic injections (“shots”), sensations can be numbed up so that the patient does not feel sharp pain. Nitrous oxide (also known as laughing gas) can also be used to relax patients having extractions performed at Dr. Street’s office. 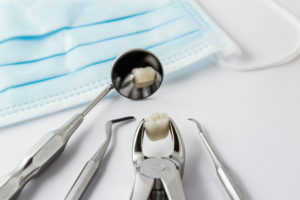 Some teeth (especially long, multi-rooted teeth) can take more time to remove than others and may require extra steps for a successful extraction. A thorough understanding of the patient’s health, past surgeries, and current medications is necessary before performing an extraction. Once the tooth is extracted, the socket where the tooth root used to reside needs time to heal. This healing involves forming a blood clot in the extraction site, which promotes bone and gum tissue to form over time. A “dry socket” is an unpleasant complication that can occur if the blot clot fails to form or dislodges before the extraction site has healed. If you think you need a tooth extraction, give your Tulsa dentist at T-Town smiles a call at (918) 488-9770 to schedule an appointment.